This week’s sportsman racing Top 10 includes action from the 23rd Annual Million Dollar Drag Race, NHRA Lucas Oil Drag Racing Series events at Rockingham and St. Louis, along with the IHRA World Finals at Memphis. It was a big weekend for sportsman drag racing and DragChamp has the Top 10 stories. 1 – “Skinny” Kenny Underwood wins The Million for the second time – Kenny topped off an already spectacular season, where he has won or made the final at big dollar bracket racing events all over the country, with his second Million Dollar main event victory after he outlasted a field of 299 competitors. Underwood joined Gary Williams as the only two-time Million Dollar Race winners. Kenny’s history making win puts him in the top spot on this week’s list. Click here for more coverage from the Million main event. 2 – Jonathan Anderson races himself in the Moser Shootout final – Jonathan Anderson qualified in both Super Comp and Super Street for the Moser Engineering Sportsman Shootout at the Division 2 Lucas Oil Drag Racing Series event at Rockingham last weekend and proceeded to the final round in both cars. Anderson took on the top sportsman racers in the division and ran the table for the win. An impressive performance puts him in the two spot this week. For more coverage of the Moser Shootout, click here. 3 – Cory Gulitti pulls the Crash & Go to runner-up the Million – The 17-year-old phenom from Texas made the Top 10 once again with an impressive weekend at the Million which included a runner-up finish in the Main Event. With 14 cars remaining in the Million on Sunday night, Cory defeated Slate Cummings but crashed just past the finish line barrel rolling several times before coming to a stop. Luckily “the kid” was not injured and per the rules of the Million, he jumped into his Dad’s dragster and continued his march to the final round. At 7 cars he took out Scotty Richardson and used a perfect .000 reaction in the semi’s to stop Spring Fling Million winner Randell Reid. Although Cory missed the tree in the final, this kid is a heck of a talent and will surely be a force in sportsman drag racing for years to come. Check out this video of Cory’s top end driving. 4 – Adam Davis almost doubles at the Million – AD had a successful outing at the Million after winning $25,000 on Thursday but he didn’t stop there as he made it to five cars on Friday before bowing out. Davis’s win on Thursday came in his small-tire gen 1 Camaro while his quarterfinal finish on Friday was in his big-tire Nova. AD had two great runs at one of the premier events of the season to earn the 4 spot this week. Click here for more coverage of his big win on Thursday. 5 – IHRA Crowns World Champions at Memphis – While the Million garnered most of the headlines over the weekend, the top IHRA racers from across the country convened on Memphis International Raceway in hopes of winning a world championship. Champions in Top and Mod took home $20,000, a trip to Aruba, an IHRA gold card, trophy, and championship ring. The Jr. Dragster champion earned a custom-built Jr. Dragster, $3,000 check, gold card, trophy, and championship ring. Champions included Dale Scales, Center, Tex., in Top, Toby Daniels, Barbourville, Ky., in Mod, and Kyla Feit, Wisconsin Rapid, Wis., in Jr. Dragster. Click here for full results. 6 – Randell Reid almost makes two Million Dollar finals this year – After winning the Spring Fling Million earlier this year, Randell proceeded to win the Division 4 Bracket Finals to earn a trip to Pomona to compete for the national championship. In addition, Randell drove to the semifinals on Sunday at the Million coming just one win light short of his second million dollar final round of the season. Only Jeff Verdi has made two million dollar final rounds in one season and most thought we would never see that performance again but Reid did a tremendous job only to fall one round short. Still it was an impressive performance for sure. 7 – Don Nichols takes over Super Comp points lead – After several weeks of missed opportunities, Super Comp racer Don Nichols went to the top of the national points standings with his 5th round finish at the Division 3 LODRS event at Gateway last weekend. Nichols, who’s had the best shot at the championship over the last couple of months, had not been able to seal the deal until last weekend as he battled through several early round losses. While the championship is not over, Nichols is in great shape since he still has some races left to improve his score while those chasing him are down to their last event in order to better their scores. 8 – Edmond Richardson wins his 49th Lucas Oil Series Wally – The “King” collected win number 49 at Gateway this weekend with his Super Comp victory. The win moves him into 10th place in the national standings. Congratulations on your win and let’s hope you pull off number 50 soon. 9 – Shane Carr runs deep at the Million – “Sugar” Shane came close to backing up his $100,000 win a couple of weeks ago at the SFG Super Bowl of Drag Racing with a main event win at the Million. Although Carr was eliminated by Jeff Serra at 14 cars on Sunday, he definitely made a run for the ages after his huge win at Rockingham. 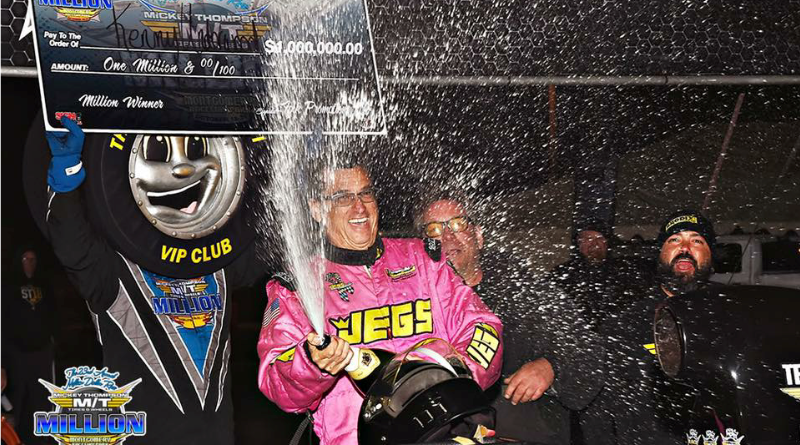 Click here for more on Shane’s recent $100k victory. 10 – Ray Sawyer and Mike Robilotto just miss – After chasing the NHRA points all season both Ray Sawyer and Mike Robilotto put up tremendous performances over the weekend only to come up just short of the championship points lead. At the Division 3 LODRS at Gateway, Sawyer raced to the Super Gas semifinals before bowing out leaving him two rounds short of the championship. At the Division 2 LODRS at Rockingham, Robilotto won the event in Super Comp but just missed the points lead after Don Nichols posted a 5th round finish at Gateway. Robilotto did all he could but came up 8 points short of the points lead. Congrats to both racers on a great season and a hell of an effort last weekend. And that wraps up this week’s Sportsman Racing Weekly Top 10. For all the latest sportsman racing news and results, visit DragChamp.com each day. Drag Champ is dedicated to Sportsman Drag Racing. Our focus centers around NHRA classes such as Super Stock, Stock, Super Comp, Super Gas, Super Street, Top Sportsman, and Top Dragster along with both big dollar and local bracket racing and the IHRA. Our goal is to provide sportsman racing news, results, and updates to our viewers on a daily basis.